This Decoder give 8 Bit Data and 10 Bit Address. HT-648L is the main schematic. This is A Simple RC switch Using IC 4001 and Transistor BC547. this IC usually use for telephone to generate DTMF tone. This is just a simple multivibrator with one timing resistor selected by a CMOS Johnson counter. In this way the start of each pulse is determined by a different potentiometer. Each potentiometer should vary from 0 to 100K. Note that normal joysticks used for computers may be fitted with a linear 100K pot but provide only 60 degrees of the total 300 degrees of movement. This means that you should either fit a 500K pot or change the timing capacitors (10n) in the encoder circuit. The ON pulse from the multivibrator should be about 300nS to 400nS in length and the OFF pulse should vary from 200nS to 1200nS. With this timing you should be able to drive almost any of the cheaper servo's (eg. Futaba, Horizon etc). The servo should give you a 180 degree movement for the full movement of the encoder pot. The 10K resistor in the encoder circuit prevents a zero-ohm pot stuffing the full supply voltage on the base of the transistor. 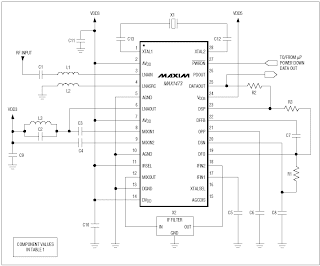 The 300K resistor determines the length of the silence between each channel pulse-train. This period of silence should be about 4mS or more. The 4017 outputs 0 - 8 can be used to give you 9 independant proportional channels but the tenth is used to provide the silence between each channel pulse-train. I have only shown six channels in the drawings so output 7 must be used to reset the counter back to 0 again. OP-Amp "a" amplifies the incoming pulses from the receiver. This stage is self biassed and may be connected directly to the output of a ZN414Z, ZN416E or any other output with between 0 to +6vDC standing potential. If the output of the receiver is capacitively coupled, has a standing negative DC potential or is DC grounded then couple the signal in via a 10nF capacitor and connect a high value resistor (470K - 2M2) between the two points marked with an "X". The output of this stage should be a near perfect square-wave. This square-wave is used to clock the channel counter and "top-up" the charge of a capacitor. OP-Amp "b" compares the charge on the "top-up" capacitor. During the 4mS silent period this capacitor will discharge causing OP-Amp "b" to reset the counter. Note that the 4017 output 0 is a reset output and the channel outputs are 1 to 6 (up to 9). The output signal from each channel terminal is a single pulse which varies from 600uS to 1600uS depending upon the setting of the encoder channel potentiometer. A normal servo has three wires; Black, Red and White. Black is negative, Red is +6vDC and the white is the pulse input from the receiver. Servo's normally draw 300mA to 500mA which may disturb the recever. If this is the case then feed the +DC supply to the servo via a 10 ohm resistor and feed the receiver +DC supply via a diode and connect a 470uF accross the receiver supply.